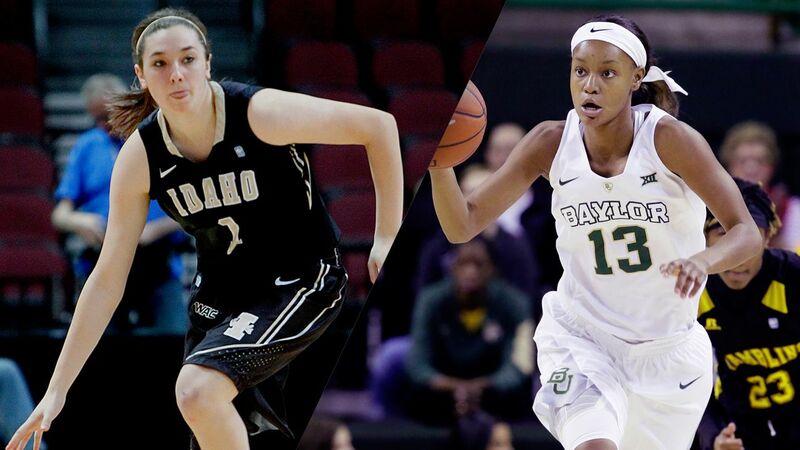 Top-seeded Baylor women roll 89-59 over Idaho to NCAA opener - Women's College Basketball - Are You Watching This?! WACO, Texas (AP) Alexis Jones had to wait three years to get back into the NCAA Tournament. The standout forward had quite a debut with top-seeded Baylor. Jones hit a 3-pointer on the game's first shot and went on to score 23 points in the Lady Bears' 89-59 victory over Idaho in a first-round Dallas Region game on their home court. Jones appeared in the NCAA Tournament as a freshman with Duke three years ago, but tore her left ACL before the postseason of her sophomore year with the Blue Devils. After transferring back to her home state of Texas, Jones redshirting with Baylor last season while recovering from the ACL surgery and a procedure to repair a microfracture in her right knee. Davis had 18 points and seven rebounds, while Niya Johnson had 16 assists and five rebounds for the Lady Bears (34-1), who have won 21 in a row. Kristy Wallace added 13 points, all while making her first five field goals in the first 12 minutes. Ali Forde had 17 points to lead Idaho (24-10), while Christina Salvatore had 12 while making only 3-of-14 3-pointers. Jones, who was MVP of the Big 12 tournament Baylor won for the sixth consecutive season, was 9-of-15 shooting with five 3-pointers, and also had eight rebounds and five assists in her first NCAA game for the Lady Bears - after this season joining their standout duo of Davis and senior point guard Johnson, the national assists leader. The Lady Bears still have a few games to go, but are only one win away from their eighth straight Sweet 16. Baylor never trailed after Jones' game-opening 3, and she also had a 3-pointer to start the scoring after halftime. Idaho entered the game second nationally with 341 made 3-pointers - more than Baylor has even attempted from beyond the arc this season, though both teams were shooting 37 percent on those shots. But the Vandals missed their first nine shots from long range and was down 19-7 before Geraldine McCorkell finally hit one nearly 7 minutes into the game. Idaho was 1 of 14 on 3s by the end of the first quarter, when it was already down 30-9. The Vandals, who made 35 3-pointers in three games last week while winning the Big Sky Conference tournament, finished 9 of 43 (21 percent) against Baylor. Baylor also made nine 3s (on 22 shots). Idaho: The Vandals are 0-4 in the NCAA Tournament, three of those coming in the last four years. They lost 105-37 at Connecticut in 2013, and fell 88-42 at Louisville the following year. ... Idaho is where Stanford coach Tara VanDerveer started her college career. She had a 42-14 record in her two seasons in 1978-80. Baylor: Freshman Kalani Brown had 10 points and eight rebounds in her first NCAA tourney game. ... The Lady Bears are 19-0 in the Ferrell Center this season. They have won 165 consecutive home games against unranked teams since losing to Auburn in the WNIT final 13 years ago. ... Baylor is 10-1 in NCAA games in Waco, sweeping through the first two rounds there in 2011 and 2013-15. ... Wallace is from Australia, while Idaho had four players on its roster from that country. Baylor: Hosts Auburn on Sunday.